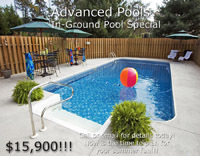 ﻿ Advanced Pools, Inc. - Harrington DE - In Ground, Above Ground Swimming pools for Maryland Delaware and Virginia - Commercial and Residential Pools for DelMarVa! Get on the schedule now, and early!! Plan ahead and make your appointment for your pool opening. We love hearing from people saying they too, are tired of this winter weather and can't wait for Summer. And when the time comes, Advanced Pools will be here to get your pool open and your water and chemicals properly maintained! NOW is the time to plan for your new in-ground pool! Don't wait until Spring is over to get things moving. Now is the time to get your plans drawn, permits obtained, and start excavation. While your friends are looking at a hole in the ground, your pool will be filled & ready to swim. Call or email today for an appointment to discuss the steps to start your pool, options and upgrades available! Click the picture or Here for a bigger view! 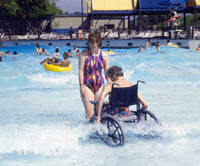 Click Here or the photo to the right to view our detailed page on the requirements of the ADA and how it may effect you and your pool. Advanced Pools can help you meet or exceed the requirements and assure your commercial facility in in compliance. Call or email today with your questions or to make an appointment to discuss the steps necessary for you pool modifications! For years we have made our simple philosophy a reality, to build every swimming pool with the finest craftsmanship, respecting our customers money and property as if it were our own. We consider this to be the main factor of why we are so successful in the DelMarVa Area. DelMarVa families loved our approach. Today we are a leading pool contractor specializing in residential and commercial swimming pool construction offering custom pool designs. We have never changed our founding philosophy. The backing of a secure, successful company with an excellent track record for the many projects we have completed.